The aquarium is not only the magical world of ornamental fish, snails and algae, it is an integral part of most modern interiors. And the aquarium has long delighted its owner with the beauty and refinement, it is necessary to maintain certain conditions with all sorts of compressors and filters, special lighting and system hydroelasticity. In addition, timely and proper cleaning of the aquarium is a compulsory condition of its contents. Over time the glass walls of any aquarium covered with greenish or brownish tinge from algae and bacterial slime. Of course, due to the RAID of the inhabitants of the aquarium is not visible. Brownish slime on the glass of an aquarium appears as a result of insufficient lighting, and greenish because of the excess. It is not necessary to clean all the walls of the tank if the RAID they do not interfere with the review. Enough to a thorough cleaning of the front glass. If plaque has formed on the glass of the aquarium with fresh water, it is easy to wash clean sponge. Only this should be done very carefully so as not to prevent the emergence of bacterial turbidity. Slowly, tightly clutching the sponge to the glass, you should lead her down to the ground. Also slowly, without lifting the sponge from the aquarium, you need to keep it up. As a result of such action on the glass should remain clear of the track. 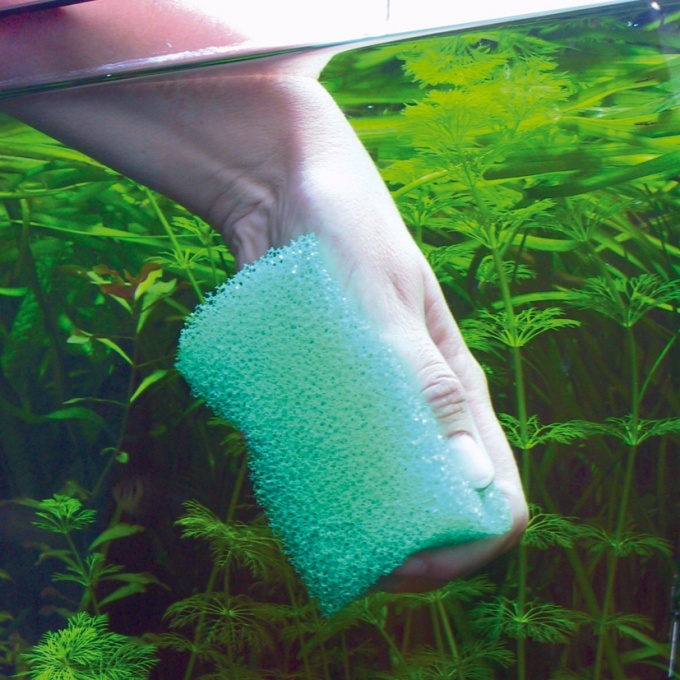 Further, the sponge should be rinsed in water and repeat all steps to complete clearance of all glass aquarium. The glass in the tank with the old water should be cleaned using a special scraper, which can be purchased at any pet store. Distinguish between spongy and magnetic scrapers. Magnetic scraper to clean the glass of the aquarium consists of two halves. One of them is placed in the water. The other part at this time, pull the scraper through the glass outside. Using this arrangement, you can leave the hands of the owner of the aquarium when cleaning dry. For shallow aquariums are perfect spongy scrapers with wooden handle. They are perfectly clean glass without leaving scratches on it and stains. To clean the glass of the aquarium can not only using special tools. In nature there are fish and seaweed, which is not worse than various devices clean small stains on the glass. Learn more about these assistants can be from sellers specialty shops. Every aquarist who cares for the beauty of your home interior and health of inhabitants of the underwater world, you should regularly clean the aquarium glass, because the thinner the RAID, the easier it is to get rid of it. The beauty of the aquarium can be spoiled by the rapid growth of algae. The water acquires a green color, sometimes cloudy, and the walls of the aquarium, plants and stones acquire an unsightly patina, or dirty threads. To completely remove algae in the aquarium is impossible, but if the time to take the appropriate measures, their growth can be restricted. Blue-green algae in aquarium, growing under intense lighting. So combat need to start with reducing the photoperiod to 8 hours for complete replacement of natural light with artificial. Kelp, on the contrary, I love low lighting, and fight with them to strengthen the intensity of the lamps. It is important to ensure that fish ate all the food, as the rotting remains of meals only contribute to the unwanted growth of lower plants. 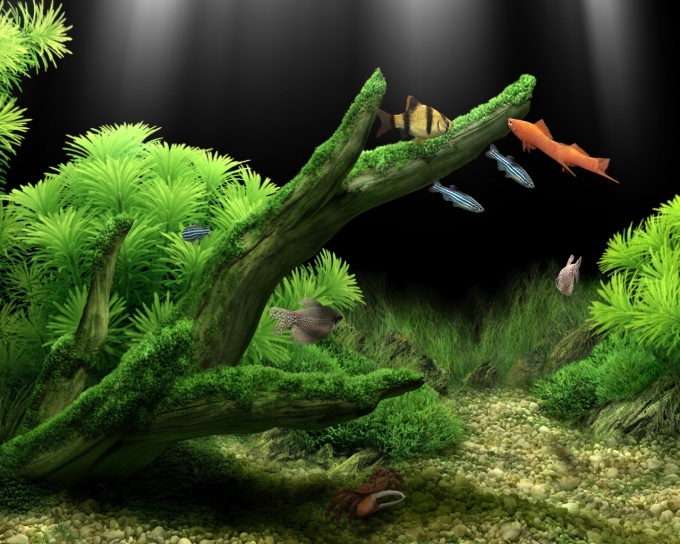 You can put in the aquarium the competitors of algae – higher plants and growing them to create a good environment for the growth and population of fish to decrease. At the same time to replace every day the tenth part of water and clean soil. There are fish that feed on algae, for example, Siamese or Chinese vodorosley, otocinclus, flying foxes, catfish-plecostomus. Even the snail, such as mollies and marinosci actively devour filamentous fouling. Will also destroy algae Daphnia, but before their start in the aquarium, all the fish you want to temporarily remove. Reduce the amount of algae in the aquarium snails-coil and ampulyarii. So they can fully restrain the growth of algae, you need to have a huge number of them, and it's not aesthetically pleasing for appearance. Very effective is the chemical treatment of the aquarium. There are many drugs whose action is directed at the destruction of algae, but after a while the algae will again begin to capture the aquarium, appeared from survivors of the dispute. In addition, some plants cannot withstand chemical poisoning and die. Time consuming but safe method of dealing with some algae is manual removal: scraping off from the walls with a scraper or rolling long strings on a stick. Many aquarists at least once, but faced with the problem of fouling of the aquarium green algae. They easily adapt to different conditions and grow rapidly. The sooner you start fighting them, the faster you will get rid of them. The most effective tool in the fight against green algae is a decrease in photoperiod to 6-8 hours. You should also reduce the brightness of illuminating lamps. Algae don't like it when they touch or move. Therefore, it is necessary as to collect them with a trap or wound on a stick. Increase the capacity of the filter to a high flow of water did not allow the algae to gain a foothold. Aeration on the contrary should be reduced. Algae do not like the small amount of oxygen in the water. Also run the aquarium floating on the surface of plants, they will shade the algae. As soon as you notice green algae, change the water changes in the aquarium. Try to change 10-20% water every day. So you don't give the algae to get used to the aquarium environment. In pet stores sell special products to prevent and control green algae. But read the label - they are harmful to some species of aquatic plants. Chemicals do not eliminate the cause of the algae. They deliver only visible greenery, and disputes still remain. If you need an emergency method of dealing with green algae, these drugs just for you. After these funds actually spent the above-described methods during the week for prevention. If you can not get rid of the green algae, as a critical method it is possible to re-start the aquarium. To do this, prepare a new pooled water. Aquarium and all accessories wash with chlorine. Some species of fish (catfish, mollies) eating green algae. They will save you the green in those places where it is difficult to get to. An alternative to fish can become snails, which feed on algae and leftovers. Before boarding the new aquarium plants be sure to wash them in a special solution. It is prepared by using 5% solution of bleach which should be diluted with water in ratio of 1:20. One of the most actual problems, exciting most aquarists is the removal of undesirable algae from aquarium. Very often all attempts to do this in the shortest time fail. Every aquarist should be aware that different species of algae should be removed from the aquarium in different ways. 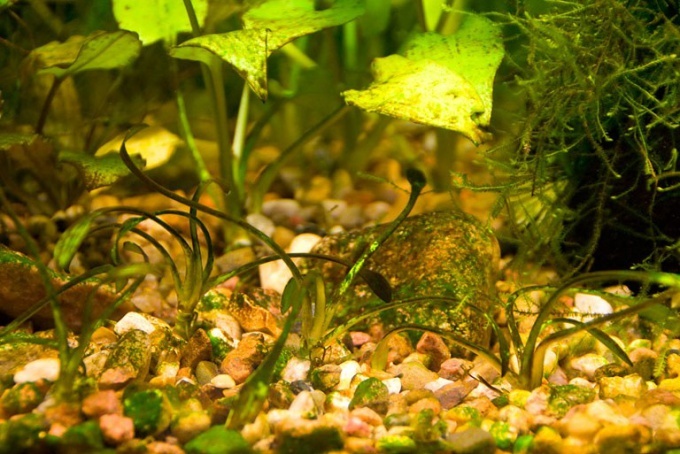 Filamentous algae, which is a long green strands, covering the scenery, the soil and large plants do not interfere with either the aquarium or the fish. But the aesthetic impression they spoil pretty much. To remove these algae from the aquarium, take a regular fork and wrap them in it like spaghetti. Tougher algae remove by hand, carefully cutting them shrouded in the leaves of larger plants. Brown algae typically colonize a new aquarium and a few weeks after the appearance disappear. If this is not happening, sat down next to the aquarium small catfish-ancistrus. Only they are able to remove brown algae in the shortest time. 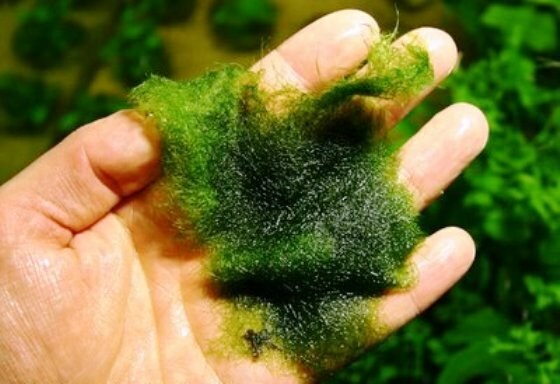 Too bright light, excess fertilizer, and the excess is supplied to the aquarium of carbon dioxide contribute to the spread of green algae, which is a velvety fluffy carpet of interwoven threads. To get rid of them, relax the intensity of illumination of the aquarium and hoisted him growing ornamental plants that will compete with green algae for the nutrients. Get viviparous fish, for example guppies and swordtails. They will also help you to deal with the emergence and reproduction of green algae. The appearance of blue-green algae forming on the ground layered film indicates a strong pollution of water by phosphates and nitrates. To get rid of them, use the siphon. To remove from the aquarium red algae forming on its decorative elements, red fluff or long, thin strands, put in a filtration system of the aquarium with a special resin, which can be purchased in a specialty pet store. The most undesirable resident of the aquarium is "Vietnamese". Its dark tassels it can completely cover all surfaces. To remove the algae you can manually. Sometimes walls, plants, soil and other accessories in the aquarium covered with a brownish tinge. It is not only extremely aesthetically pleasing, but also dangerous to aquarium inhabitants. If there is a similar situation, we urgently need to take action. Enemy of the aquarium - algae growth. This multicellular organisms, which appear under the wrong lighting and the excess of organic matter. Lighting for aquarium, cultured algae, special chemicals against seaweed and a few catfish-oncocyclus. To combat the brown algae you first need to know the reasons for their occurrence. Low light, high content of nitrates in the water, high pH, low carbon dioxide content - all of which can lead to the appearance of brown algae. Oddly enough, help us in the fight against brown algae can become higher plants, that is, cultural algae, specially planted in the aquarium. They will absorb all the nutrients, dissolved in water, and brown algae do not get it. 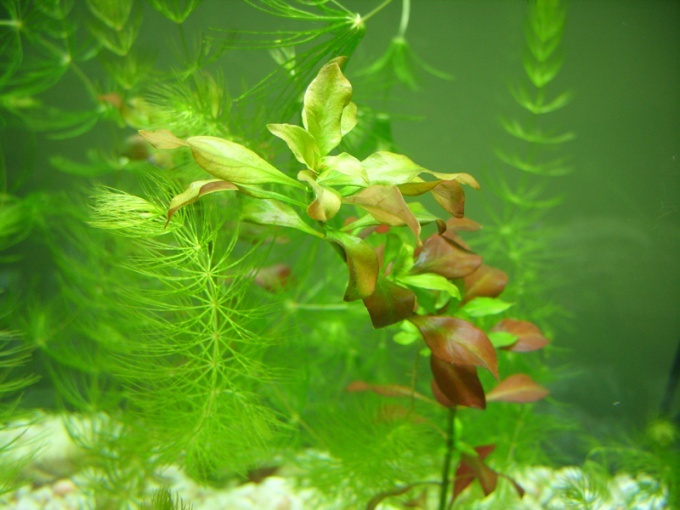 To fight against aquatic enemy to effectively use fast-growing plants need a fairly densely planted their entire area of the aquarium. You need to create the right lighting for best plant growth, the light day should be about ten hours. The need to reduce the content of organic substances in the aquarium. It is important to regularly replace part of the water volume and reduce the amount of feed. Pets have to eat all the food in about two minutes, the rest is surplus. Extremely useful to put in aquarium several catfish. They love to eat brown algae, and they will be happy to help to get rid of them. Five catfish-otocinclus able to maintain order in an aquarium with a volume of one hundred liters. Emergency measure in the fight against brown algae is to use special chemicals. However, it should be remembered that their effectiveness is temporary. Such chemicals are sold in the pet store. The consultant can help you choose the best option. There are also special water conditioners, they accelerate the cultural growth of aquatic plants and improve their appearance. Catfish-otocinclus is a true "janitor" for the aquarium. Easier to deal with brown algae, if you find out the reasons for their occurrence.